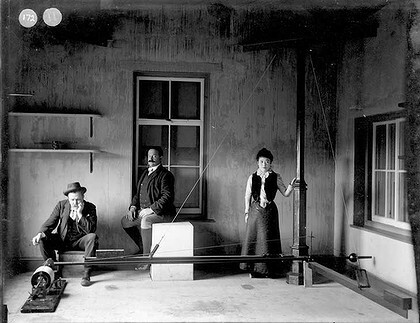 John Milne with Russian seismologist Prince Boris Galitzin and his wife Tone Harikawa looking at one of his seismographs on the Isle of Wight in 1911. Read more: http://www.theage.com.au/national/melbourne-life/the-father-of-seismology-20110317-1bz0l.html#ixzz2J9SPdVgJJohn Milne- "Earthquake Milne"
John Milne was born on December 30th, 1850 in Liverpool, England. He received his credentials to be a mining engineer after he attended King’s College and the Royal School of Mines. He then started working in Europe and then Newfoundland as a mineral investigator. In 1874, Milne went on a mining expedition to Sinai. At the young age of 25, he became a professor at the College of Engineering in Tokyo, Japan. His travels there were quite interesting. It took him 11 months to travel there by way of land. He wrote a book about his observations of the weather, the flora and fauna he encountered on his way to Japan. He even traveled through Siberia and arrived in Japan in 1876. He was lucky enough to experience an earthquake on the first night of his arrival. When he first arrived he was studying Volcanology( he climbed over 50 volcanoes) and continued to do so until 1877. Then he attention diverted to the study of earthquakes. Because of the deadly (~70,000) earthquake and tsunami of 1755 in Lisbon Portugal, interest in earthquakes escalated in the next 100 years but this was still 100 years before the theory of plate tectonics. Many scientists were looking for better ways to develop and collect data. Milne was more recognized by the Japanese government than he was by his native country. He decided to moved back to England after a fire in Japan destroyed his home in 1895. He moved to the Isle of Wight with his wife, Tone. Here is a partial list of Milne's seismographs by 1900. John Johnson Shaw was vacationing and they became wonderful friends. Shortly before Milne's death he created a seismograph with John Johnson Shaw in 1913 and it was called the Milne-Shaw Seismograph. In 1913, they created the Milne- Shaw Seismograph. This seismograph could mangnify up to 500 times. Shaw used photgraphic and optical means to reach this high of magnification. Shortly after they collaborated, John Mine died on July 31, 1913 from kidney disease. He invented the first seismograph in 1880 and this lead the way for more data and observations to be gathered concerning earthquakes. Another interesting fact is that he was able to seismograph sent to telegraphs stations around Japan. This was the first data that was gathered for the fault line that is now called the Pacific Ring of Fire. This would also add more fuel to the theory of plat tectonics a 100 years later. Also known as the "Earthquake Milne"
Created the Seismological organization in Japan with Gray and Ewing. All three were British scientist. Then was elected Fellow of the Royal Society in 1887. World-wide seismological networks – Created a network of earthquake observatories. He wrote a humorous travel story and a number of science fiction books. He was a wonderful storyteller and everyone that meet him loved hearing his stories. He was a humorus man and loved by all. He had a bushy, nicotine stained mustache and a loveable personality. Boardman, David. "John Milne." John Milne. The Metropolitan Borough of Rochdale, n.d. Web. 3 Feb. 2013. <http://manchesterhistory.net/rochdale/milne.html>. "'Earthquake' Milne." 'Earthquake' Milne. Isle of Wight Rock, n.d. Web. 3 Feb. 2013. <http://www.iowrock.demon.co.uk/profiles/iow_profile_milne.html>. "History of Seismology." Untitled Document. Asian Seismological Commission, n.d. Web. 3 Feb. 2013. <http://www.asc1996.com/history1.htm>. "Image of Milne-shaw Seismograph No 1, 1914. by Science & Society Picture Library." Image of Milne-shaw Seismograph No 1, 1914. by Science & Society Picture Library. N.p., n.d. Web. 3 Feb. 2013. <http://www.scienceandsociety.co.uk/results.asp?image=10284324>. "Inventor of the Week: Archive." Inventor of the Week: Archive. MIT, May 2005. Web. 3 Feb. 2013. <http://web.mit.edu/invent/iow/milne.html>. "John Milne (1850-1913)." John Milne. Earth & Atmospheric Sciences - Saint Louis University, n.d. Web. 03 Feb. 2013. <http://www.eas.slu.edu/People/BJMitchell/TextPages/milne.html>. "John Milne." John Milne 1850-1913. International Seismological Centre, n.d. Web. 02 Feb. 2013. <http://www.isc.ac.uk/about/history/milne/>. "John Milne." John Milne. Manchester History, n.d. Web. 05 Feb. 2013. <http://manchesterhistory.net/rochdale/milne.html>. "John Milne." Wikipedia. Wikimedia Foundation, 02 Feb. 2013. Web. 02 Feb. 2013. <http://en.wikipedia.org/wiki/John_Milne>. "P- and S- Waves." Â«ABAG Earthquake and Hazards Program. N.p., n.d. Web. 4 Feb. 2013. <http://quake.abag.ca.gov/students/seismic-waves/>. Shaw, Jennifer. "Google Maps." Google Maps. N.p., n.d. Web. 05 Feb. 2013. <https://maps.google.com/maps?hl=en>.